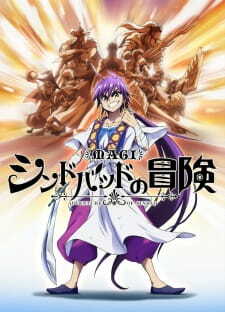 The Magi: Sinbad no Bouken OVAs were aired as episodes 2 through 6 of the television series under modified titles. Like anything to do with Sinbad, the oh great and glorious conqueror of the Seven Seas, it's mostly the same but they add some depth into the way he goes about his life and how he got to where he is. With the third OVA released I couldn't wait to watch it and I did straight away, even being in area with little to no internet, I loaded the episode and watched it when it was done and man did I enjoy it! It was everything I wanted (well except the cliffhanger :/). It's all about SINBAD! when it comes to these OVA's, hence the name. It goes through early life troubles of himself, his family, his village and his comrade Drakon. The story works well and they show everything needed and it's very easy to understand which is good if you're looking for a easy and relaxing OVA to watch. The story for the new OVA is about one of Sinbad's eight generals in his early life and he must prove himself as a man in front of his sister by slaying a sea monster, while on the verge of death, Sinbad comes outta no where and slays the beast and saves them. He gets invited to their isolated icy village and hears about a new dungeon and he warns the village not to go and that he must do it so no one else would get killed. With Hinahoho getting false credit for slaying the beast, he wants to prove himself and goes to the dungeon. It's the complete same as the normal anime so their won't be any surprises when you watch this, there's detail on characters that don't need a lot of detail for them so that's a good touch. The art always amazes me and with the third OVA it still did, to me it just added the icing to the cake after the long wait for this. Just like the normal anime so if you enjoyed the sound in that, you'll enjoy it in this :). They don't go into very much detail with any character, a little with Sinbad but other than that, no. Sinbad was born with great power, oh cool, and cliché. With the rest of the characters, they're just military people and want power, not much of a big surprise. On the other hand Yunan is a mysterious character with little known about him. In the third OVA they introduce Hinahoho and his little icy village, along with a few more characters such a his sister, father, etc. With all the new characters added, I thought they did well with giving us enough information about them all and made it a very good watch. I thought that this was a great watch, mainly because I get to watch more Magi. I have enjoyed all of the OVA's that have been released so far and with the 4th one being announced, I just can't help myself to get excited. I can't wait. (With this being newly updated for the third OVA, I will be updating it again for the earlier episodes and adding more to the review). I must admit, the tale of Sinbad- King of Sindria, Conqueror of the Seven Seas, a legendary man whose mythical adventures have been woven into countless movies, books, and cloth- is a rather difficult story to tell. So far, Magi season one and two have both done exceptionally well in portraying Sinbad as a grown man in charge of a nation. Rather than sticking to just the classic mold of "Sinbad the great sailor!" or "Sinbad the witty, flirty, virtuous bad boy! ", they add depth by darkening the inner workings of his tactical mind. However, the same effort in characterization was not applied to either of the OVAs of Sinbad's adventures. ..wrong...And before you know it, the producers have dragged you into one of the most cliche, overdone story lines known to fairy tales. Sinbad's portrayed as the classic hero, complete with a tragic background story, the help of a supernaturally gifted stranger, and everything else that serves as the pedestal upon which this adolescent's destiny sits- awaiting his overbearing greatness. While the main character's traits are clearly established alongside the antagonists' and a clear goal is conveyed, the origin- the story behind the very essence of Sinbad's character is unfortunately, not the work of just his own hands, but of the imperious power of 'destiny' that he was assigned from birth. The second episode of the OVA consists of Sinbad and Commander Drakon's meeting, and together, they face the creatures of the dungeon. While this episode is action-packed and amusing, it fails to retain any hold on reality when Sinbad flips the bird to every law in physics. Another irk is that Yunan can be officially branded as the deus ex machina magi when he appears out of nowhere to do nothing but act like Sinbad's personal magician. The final moments of the episode are drenched in a vat of cliche tropes. The third OVA, however, redeems this series more than I hoped. It finally introduces a brand new character and hurries along the plot to a possible dungeon fight that may occur. This episode brings back the classic excitement that often accompanies the tales of Sinbad. If the series is ever continued or revived separately, any episodes from here on out will surely lead to a better telling of Sinbad's adventure and it may finally give his character the depth it deserves. The art is just as amazing as it was in the series- perhaps even more so. Details are not shirked and even minor characters are given diverse facial features that go beyond the usual haphazard sketches. The quality of the other two episodes is similar, yet not quite on par with the extraordinary display of the first. Nevertheless, the animation itself is enjoyable overall. As is the soundtrack- the only two notable bits of music being at the beginning and ending of the first OVA, the ending rock instrumental that rolled with the credits at the end of the second OVA, and everything else flows on the waves of equilibrium. Here's where they stopped hammering the nail in halfway through the script. No one's hair is incredibly long and luxurious as Sinbad's! And they'll tell you whose team they prefer to be on! And his name is SINBAAAADDD! Unfortunately, Sinbad's characterization falls flat. They might as well have inserted the song montage in the background to accompany the numerous occasions that validated the glorious, inherent valor of Sinbad who- around the age of four, 'somehow' supernaturally directed his father which way to row their boat to get out from under the raging storm. He all but rowed the damn thing himself- which, of course, would have been far too absurd to show. It's understandable that the directors want to stick to the conventional tale but Magi's been about deviating from the given plot line and spicing it up. I honestly looked forward to the twisting of Sinbad's tale into something thrilling-perhaps about a boy who wasn't meant for greatness, but instead I was met with the same old generic set-up for a child's play of heroism. As for less familiar characters such as the traveling magi: Yunan, or the ruthless military commander leading the next dungeon raid: Prince Dragul, and his childhood family friend: Princess Serendine- they all attempt to squeeze their personas into trope coffins as if the entire point of their existence is to offset our main character as the 'good guy' who always knows the right thing to do. By the time we reach the second OVA, the characters still lack depth. The third OVA, on the other hand, redeems itself by introducing new ones that gain depth through the hurried narration of events- which fits the pace at which Sinbad leads his adventures. Although the episode ends as a cliff-hanger, it holds much more potential than the first two stints. All in all, the three-pack episodes of Sinbad's adventures are mildly amusing. The art is superior to that of the series itself and the soundtrack appears new- making it a worthy watch if only for the sake of aesthetics. However, the plot line itself is lackluster in comparison to the series due to the standards (of the original series) that it's held against. At the very least, the OVAs can be viewed as the classically cliche retelling of the animated version of Sinbad the Sailor with the conjunction of Magi's take on magic- making the shortened tale an entertaining ride till the very end. There are so many things special about Magi: The Labyrinth of Magic, but most of it stems from the whimsy that the OP brings to life. Lets take a look at it!